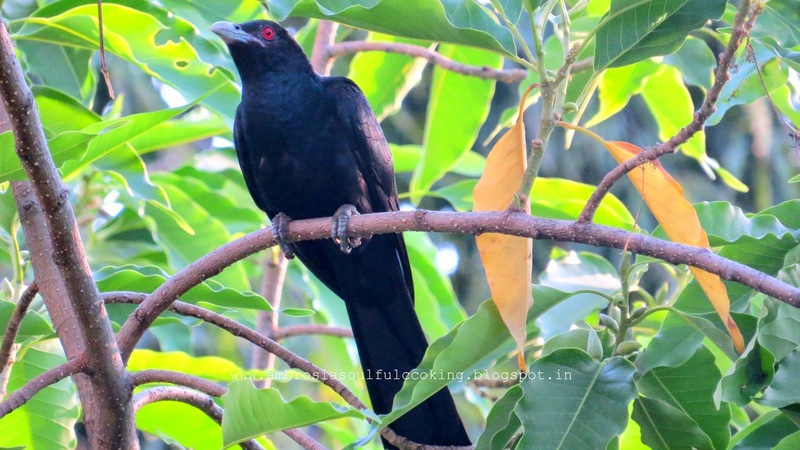 The cacophony of Bablers drive away Cuckoo from the Jamun tree. 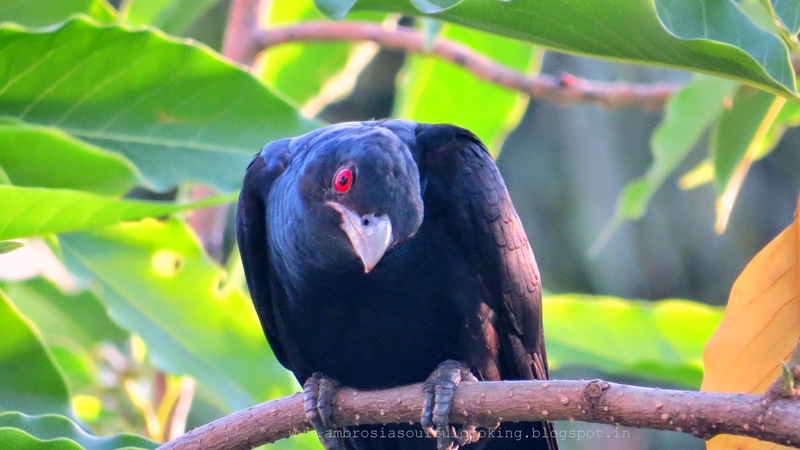 He glides gracefully and settles in a branch of Magnolia tree. Fresh green and tenders leaves have sprouted in the branches after leaf shedding. 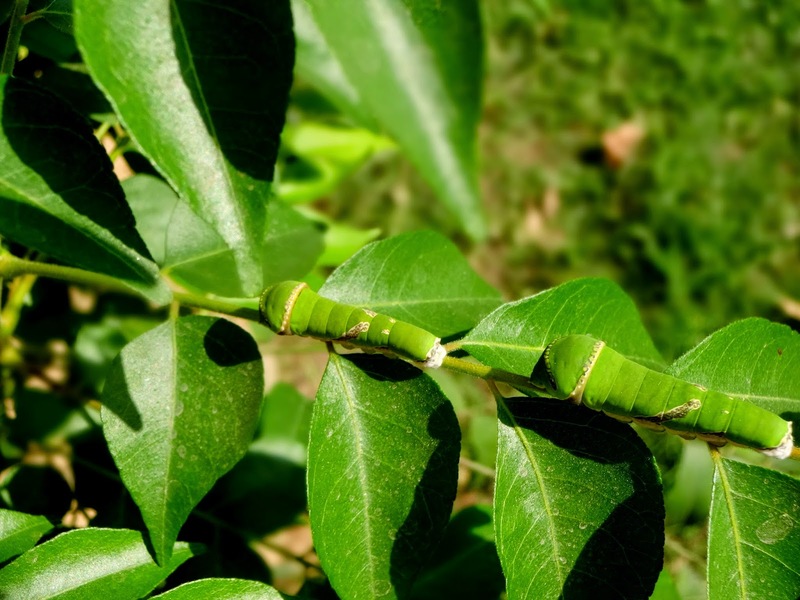 There are butterfly and moth caterpillars in the leaves, camouflaged beautifully, often difficult to spot, cradled by the gentle breeze, devouring juicy leaves and changing colour and size almost every day as they pass from one phase to another. My son curiously counts the caterpillars in the curry leaf plant. 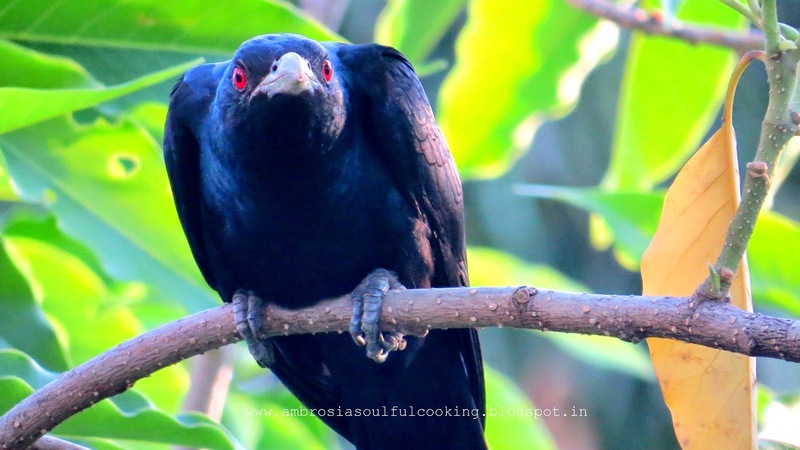 Young ones resemble bird droppings while the older ones are perfectly merging with the leaves. 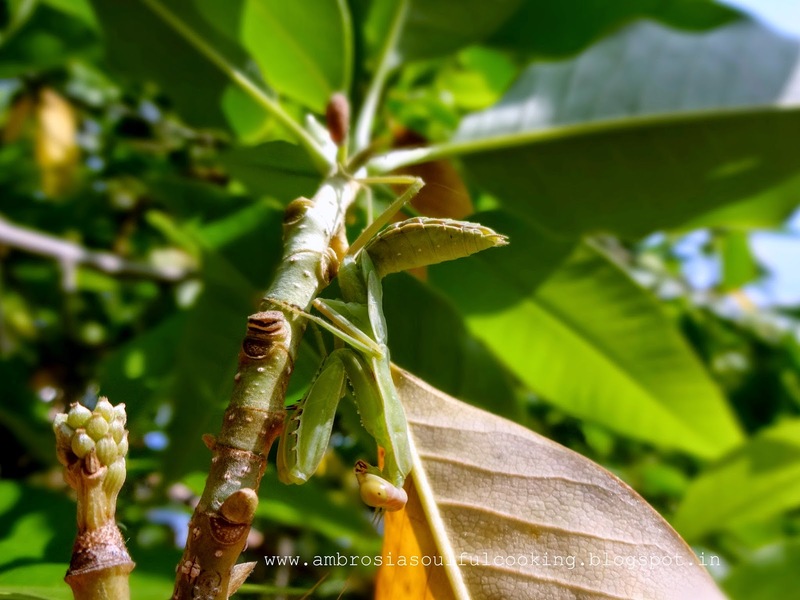 A praying mantis hangs upside down from the magnolia leaves keeping an eye on the small insects and flies, lunging at it’s prey immaculately. We spot two more caterpillars in magnolia leaves. A complete ecosystem is thriving here. Some overripe bananas in the counter give out lovely smell. I decide to bake Chocolate Banana Cake. Bananas add great flavour and give a tender crumb to the cake. The cake tastes best next day. 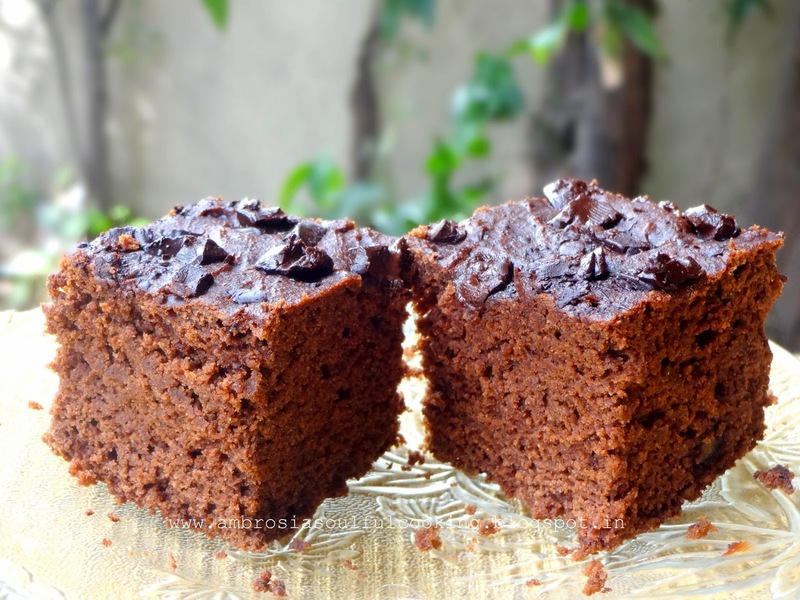 Dense, moist, flavourful and deliciously healthy. Preheat oven to 180 degrees C. Line the bottom, grease and dust the sides of one 7x7 inch cake pan. Whisk together first four ingredients. Pass through a sieve to remove lumps. Puree the bananas. Whisk in melted butter, sugar, egg and vanilla extract. Add dry ingredients and stir until just combined. If the batter feels too thick or dry, add a tablespoon or two of milk. Fold in ¼ cup chocolate chips. Pour the batter into the prepared pan. Sprinkle remaining chocolate chips. Bake for 35 to 40 minutes or till a toothpick inserted in the center comes out clean. Cool in the pan for 5 minutes. Invert it out onto a cooling rack. This cake just looks so amazing! 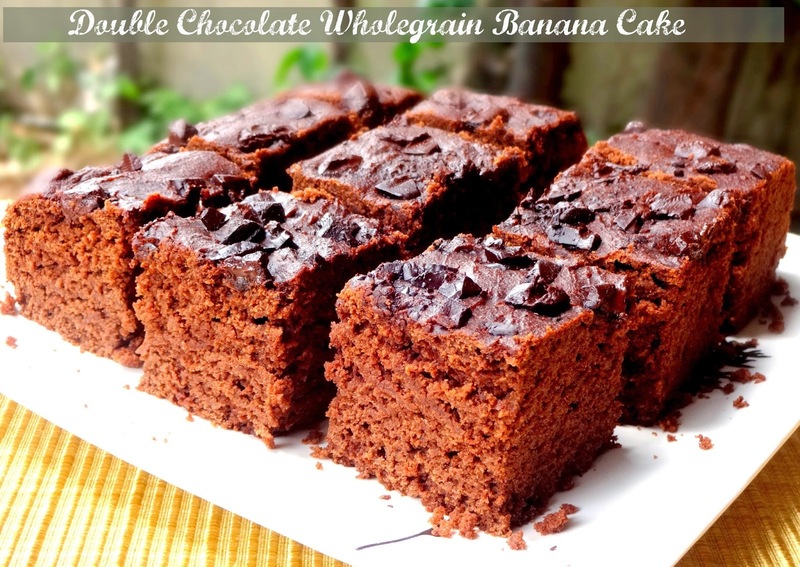 I love banana bakes, but never tried them with chocolate.. bookmarking this one! Thank you Rafeeda. Hope you enjoy baking and eating this one! 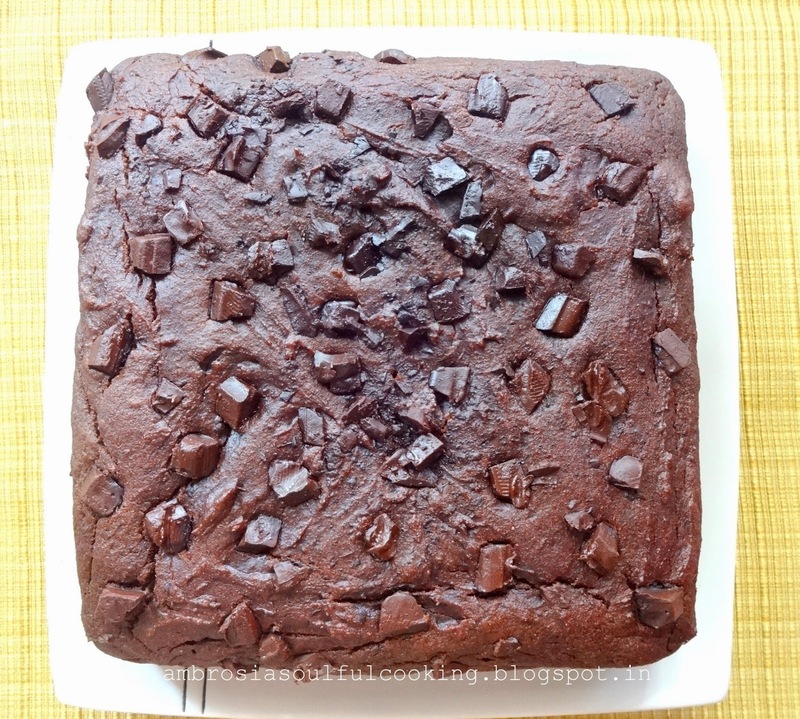 Tried this recipe today and it turned out super moist and yummy.